Celeste and Jesse Forever is a new indie spirit rom-com with an interesting twist: the two characters were married but are now best friends living together because they can’t stand to part. Rashida Jones co-wrote the film with Will McCormack, and has based some of it, inevitably, on her own dating experiences. Andy Samberg gets to play a grown-up for the first time (well, he’s a man-child), but in it he demonstrates pathos and range. The two characters eventually learn to date outside of their bubble. Rashida and Andy were in Los Angeles to discuss the film at roundtable interviews. Rashida explained the crux of the movie and its background, while Andy flirted a little. In your minds, how long does it take to get over an ex? Rashida: It takes a long time. They say it takes half the time you were with somebody. That’s the formula. I think that’s true! Andy: I think if you’re really in love with someone and have a serious relationship it takes until you fall in love again. That’s been my experience. Rashida: I am so bummed. Andy: Or half the time! Rashida: That’s not true. [Pause] For men I think it’s true. That’s what gets them over it. How much of Celeste is you? Rashida: Unfortunately, probably more than I would like. I would like to think I took my idiosyncrasies and magnified them to come up with somebody whose character flaws stand in their own way. I’m not paralyzed by my own needs for control and my need to be right. But there have been times where that has been true. I must rule. Andy: It’s the old you! Rashida: It’s the old me. I’m a new me, now. Rumor has it you wrote this movie for ten years? Rashida: We wrote it four years ago. Definitely it is a collection, a composite of relationships, that I’ve had and my co-writer Will had. But we used a lot of ourselves in it for sure. It has about ten years of experience in it. Andy, how about you. Is there some man-child in you like Jesse? Andy: [Stilted Chuckles] I don’t think anyone would argue I’m not… But yeah, certainly the idea of someone who is slacking a little or not realizing his potential… that was a big part of my life. I think my parents were worried for awhile. Then I got super-lucky. I connected to my character’s approach to life. But he’s more laid-back, as where I am a more business-driven person. Andy: It’s not a coincidence I did digital shorts and update features on SNL almost exclusively because I did stand-up and short films before I got hired there. This movie shows both your dramatic and comic gifts, was it a stretch? 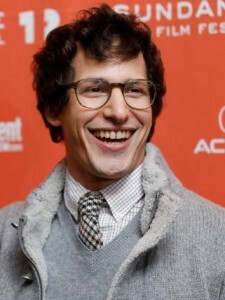 Andy: I personally wasn’t surprised how good a dramatic actress Rashida is. You certainly don’t know she is until you see this. The terrible dates as shown in the movie are based on truth? Not the photographer, the sleaze that dry humps you without permission? Rashida: Oh yea, the photographer – real person. When we met, that’s what happened to me. Isn’t that horrible. First date. Andy: I’m just impressed he had the gall to do it. Andy: I’m not!! I’m not!! Rashida: After I got over the initial shock and trauma of it happening to me, it became a good party story. The one time I ever did stand-up, I told that in New York. I was like, you know, the guy needed a comeuppance. The way to do it was to write a script. Some of us wonder if your multi-ethnicity is a factor to your career. Do you think about that? Andy: [Jewish droll accent] Your guess is as good as mine! Rashida: It’s weird, I think it’s more a challenge for other people. I don’t have issues about my identity. I relate to every side of my family. I am Jewish. I am African-American. I am Irish. I am Scottish. I am Polish… I was never brought up to distinguish, I was brought up to identify and celebrate those things. I do think that other people think I should be settling for one thing or another. I want to be able to just play whatever I feel like playing at the time. Being young in my career, I was limited because I was deemed too dark for some parts, or too light for some parts. I was not quirky this. Or that. In my career now, I no longer feel limited. Is it bad that I’d see it just for Rashida Jones?